Walking along Boston's historic Freedom Trail and part of Boston's original coastline, children will experience the historical sites that played a key role in American independence: Faneuil Hall, the Old State House and the Old South Meeting House. Learning about the Boston Massacre on the site where it occurred brings a new dimension to the study of American history. Stops also include the site of the first public school in America and the oldest burying ground in Boston. This tour covers ten sites in downtown Boston but is 30 minutes shorter and faster-paced than our Heart of the Freedom Trail tour. Our guides love to point out the fun and interesting attractions along the route such as a 1743 weathervane, the Royal Lion and Unicorn, along with statues of Benjamin Franklin, and a Democrat donkey. Our guides will help your child learn about our Boston's role in the American Revolution and discover the materials from which a city is built. This tour fulfills elements of the Massachusetts State Curriculum Frameworks, and is a perfect activity for school groups, or any group of children wanting to explore downtown Boston. Please contact us to arrange a tour for your school or community group. General Admission $12; Save $2 when you buy online; Free for children under 6 years old and Boston By Foot members. 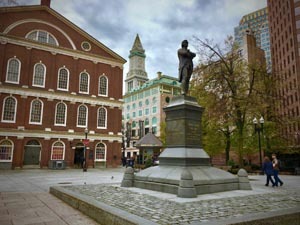 Meet your guide in front of Faneuil Hall at the Samuel Adams statue, Boston.